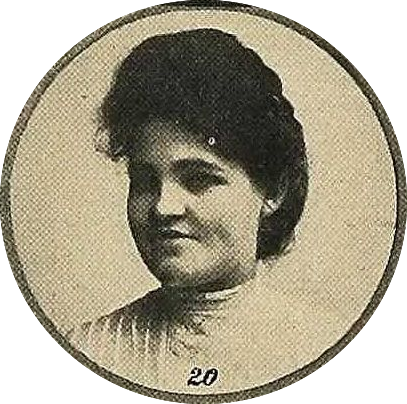 Mildred Burleigh was born Mildred E. Burley in Indiana in January 1887, according to the 1900 U.S. Federal Census. She was the third of five children born to George and Mary. Her father worked at a factory polishing bicycles. They resided in Huntington, Indiana at 119 Elm Street. …Miss Mildred Burley, teacher of drawing…will probably remain. The school year has been a very successful one. The senior class has seven members, one boy and six girls. The 1910 census recorded Burleigh in two states. She was included her father’s household in Huntington where he was a widower. Burleigh was a boarder in Vaughn, Wisconsin. In both states, her surname was Burley and occupation was public school teacher. At some point, Burleigh moved again and taught in Oregon City, Oregon. Later, the Oregonian, September 6, 1914, said Burleigh, teacher of art, had resigned from the Oregon City High School. The newspaper also published her surname as Burleigh. The Fourth Estate, September 9, 1922, said she had taught in Wenatchee, Washington, but no date was mentioned. In the 1920 census, Burleigh and her younger brother, Ralph, a chemist, boarded in Chicago, Illinois at 5518 Ohio Street, and their surname was recorded as Burleigh. According to the census, she was a bookkeeper at a state bank. Burleigh was also a cartoonist for the Chicago Tribune, which syndicated her comic, Pigtails, in 1921. American Newspaper Comics (2012) said Pigtails ended August 19, 1923, and a week later, Burleigh’s Kitty and Her Family debuted. Kitty ended February 10, 1924. Burleigh and her younger sister, Jean, were residents in Queens, New York, at the northwest corner Skillman and 47th Street, as recorded in the 1930 census. Burleigh was a freelance artist and Jean was a reporter. The 1940 census said Burleigh was a freelance advertising cartoonist. She and Jean shared an apartment in Manhattan, New York City, at 315 West 57th Street. Both sisters were college educated; Burleigh had five years and Jean just two. At Ancestry.com are two New York City directories for the years 1948 and 1949 and both list Burleigh at 107 Waverly Place. Her sister, Jean, remained at the 57th Street address. Two more directories for 1953 and 1957 list a “Mildred T. Burleigh” at 57 West 10th Street. The middle initial T could have been an error since it sounds a little like E. Again, Jean’s address was unchanged. What happened to Burleigh after 1957 is not known. Jean passed away in 1974, and Ralph in 1975; both were buried in Indiana.